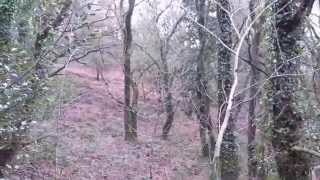 Allt Dderw is part of a larger woodland known as Glasallt-fawr Woods and is situated a short distance away from the western edge of the Brecon Beacons National Park and is surrounded by dramatic hills and green pasture. From this gently sloping hillside there are outstanding views across the Towy valley. The majority of Allt Dderw is designated as Ancient Woodland, meaning it has been woodland for hundreds of years. Access is through a locked gate by 4 wheel drive vehicle and there is a newly created parking area off the track with plenty of room for several vehicles. A good path leads you from the parking area up towards the viewing platform where you get a good panoramic view of the whole woodland and surrounding countryside. There are plenty of gnarly Oak trees at its centre as well as Birch, Hazel, Rowan and a section of Larch on the lower level of the hill. Towards the Southern boundary in the heart of the woodland there are sheltered areas as well as sunny and open glades intermixed with some magnificent specimen Oak trees. A new path has been cut leading to the right as you come in to Allt Dderw. This will bring you to a new small clearing with a bench from where the path continues down opening up the lower part of the wood and linking up with an old existing grass trackway. It's a steep climb back up to enjoy the wonderful views out from the small plateau near the southern boundary where there is another small clearing and bench to rest your legs. In Spring the woodland floor is covered with a carpet of Bluebells and in Autumn a wide selection of interesting Fungi. You may also find evidence of a healthy Badger population (a trail of hay can clearly be seen from their setts to a neighbouring meadow). Red Kites and Buzzards are regularly spotted flying overhead. Allt Dderw is located just outside the town of Llangadog which has some friendly pubs as well as a post office and small convenience store. Only a few miles away is the old market town of Llandovery, which has useful shops, cafes and places to stay, as well as an impressive castle. There are many opportunities for exploring the surrounding area with good walks, bike riding and the magnificent river Towy which runs through the bottom of the valley. The boundaries of this woodland are marked indicatively in orange paint on trees and small stakes. From the M4 motorway at Pont Abraham (the end of the motorway as you drive west) take the A483 towards Llandeilo. Here join the A40 heading north to Llandovery. At a roundabout, take a right turn to Llangadog (A4069). Continue into the village where you will see signs to Llandovery (A4069). Follow this road for about a mile until you see a wide entrance on your right which is the lane leading to the Glasallt Fawr Centre, follow this lane (over the cattle grid). You will see a gate on the left hand side with a 'woodland for sale' board attached. For viewing you may park infront of the previous gate, so long as you take care not to block the lane.